Roberto's Formula One career was over almost before it started when he failed to qualify a Lotus at the 1982 Dutch Grand Prix. He was to get another chance, but that race handicapped him for a number of years. After finishing second to team-mate Mike Thackwell in European Formula Two in 1984, Roberto moved to Indy Cars. A return to Europe in 1987 saw him race in Formula 3000 and he also had a few outings for the fledgling AGS team. He stayed in Formula 3000 in 1988 and won the title impressively. Ferrari awarded him a testing contract and he raced for Coloni, and Eurobrun, before being given his break late in 1990 at Benetton, replacing the injured Alessandro Nannini. A second place behind team-mate Nelson Piquet at Suzuka ensured he was kept on, but he was fired (just after finishing fourth in the Belgian Grand Prix), as Benetton snapped up Michael Schumacher. A year with hapless Andrea Moda in 1992 was less than he deserved. 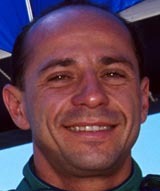 Roberto then suffered with the hopeless Forti Corse team in 1995 and moved back to Indy Cars for 1996.